From the beginning, Hop Fastpass™ has been about convenience. Transit riders simply pay their fare by tapping a Hop card every time they ride. Now, riders can purchase or reload their Hop cards with cash, 24-hours a day, seven-days a week with the addition of more than 100 Plaid Pantry convenience stores to our retail network. Also, riders can use cash to reload Hop cards 24/7 at any 7-Eleven store in the region. In a matter of months, we’ve expanded our network of Hop retailers to more than 350 – a first for a transit agency of TriMet’s size. This means using transit throughout the Portland-Vancouver region is now even easier. Nearly 2 million Hop card taps. More than $3 million in loaded fare. More than 45,000 Hop card activations. Hop cards work like gift cards. Once you have one, simply add money, and then tap the card to the Hop reader to board TriMet, C-TRAN or the Portland Streetcar. Having one, universal fare card allows us to seamlessly connect riders and easily get them where they need to go. Tap to transfer to a mode with higher fare – pay only the difference. Tap for two trips more than 2 ½ hours apart in one day – earn a day pass. Earn 20 day passes within a calendar month – ride the rest of the month for free! Hop ensures you never pay for rides you don’t take and makes it easier to pay fare. No need for exact change, just add money to your Hop card at a retailer, online at myhopcard.com, using the Hop mobile app or over the phone at 844-MYHOPCARD (694-6722). The Hop Fastpass system also makes it easy to ride transit for less frequent riders including tourists and visitors. Anyone who already uses Android Pay, Apple Pay or Samsung Pay can simply authenticate payment and tap their phone to the Hop reader to purchase Adult fare. Hop readers are located on board all TriMet and C-TRAN buses, at the platform of MAX, WES and Vine stations and on every Portland Streetcar. 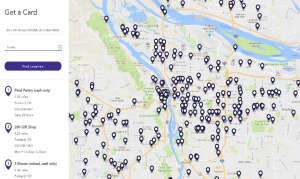 Adding hundreds of Hop retail locations is just one of the ways TriMet is Making Transit Better. We are adding bus service, improving system reliability, renovating our oldest MAX stations, enhancing safety and planning for the future to address transit needs along our region’s most congested corridors.